Most of us have heard or said the phrase, “Try it, you might like it!” As designers and producers of direct mail, IWCO Direct often takes the “try it” approach to direct mail format testing to expand our knowledge and capabilities. It also helps us bring new design innovations and fresh ideas to clients. Production testing can provide valuable insight into many aspects of direct mail design and opportunities to enhance our production capabilities. Regardless of pass or fail, those tests teach us a great deal and can steer us toward new solutions. Capturing all this value is predicated on having a strong process and approach to direct mail testing. That doesn’t mean testing or trying something new is for everyone, as my own kids have clearly demonstrated all too often at the dinner table! First, you need to have a willingness and openness to testing. It’s far easier to just say “no” and never try something unknown. You need an experienced staff who really enjoy the challenge of tackling these complex puzzles. Over many years of testing at IWCO Direct, we have learned how to leverage our very best people to get the most out of direct mail format testing and avoid the obstacles and pitfalls that can negatively impact the results. It also takes resiliency. I’ve heard it too many times in the past; someone will say, “See? It won’t work!” after only one attempt. Experience and willingness to try are invaluable and drive the innovation and creativity that expands our capabilities. 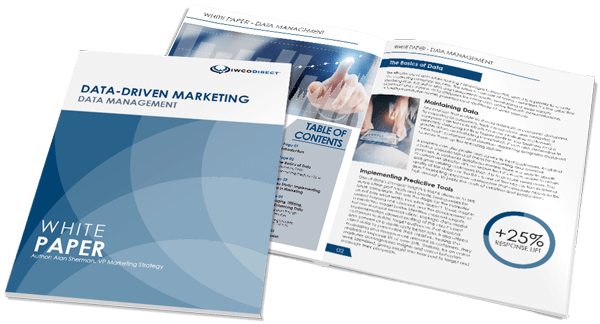 The next important aspect of the direct mail format testing process is capturing and communicating the results. This is a critical step to provide a clear and concise answer to the original question. At IWCO Direct, we have created systems and processes that provide automatic notifications to facilitate timely communication and avoid delays in the creative process. This communication is extremely beneficial for tests that change and evolve through the multiple iterations that may be required to deliver the best possible solution. The clear documentation in the system also creates a historical reference that we leverage to build on our past experiences. Additionally, it provides an excellent reference site for training and rolling-out new capabilities. Those who have firsthand experience with direct mail format testing know it can be challenging to recreate the same results without good documentation. This enables us to successfully recreate the same results on future production jobs. IWCO Direct embraces the direct mail format testing process and uses the lessons we learn in the process (including the failures!) to drive the creativity and innovation you need for your marketing success. This same philosophy and approach is evident throughout IWCO Direct’s business processes, from marketing services to postal optimization. Have a unique direct mail format you need to fine-tune for efficient production? Contact your IWCO Direct account team and we’ll be happy to start testing.